Sweden and Norway are the perfect settings for a winter holiday – offering travellers clean air, pure water and stunning scenery that includes amazing mountains, beautiful fjords, remote islands and coastlines to die for. Scandinavia is also well known for its culture and sightseeing opportunities, as well as historical and modern cities. If you can’t wait to get to grips with fluffy snow or prefer to try and get a front seat view of the photo opportunity of a lifetime, the Northern Lights, a winter holiday in Norway could well be the trip you’re looking for. Winter tours of Norway could cover absolutely anything from a fabulously fun dog sled ride, some local history from the indigenous Sami people, a cruise to the beautiful winter city of Tromsø , or staying in an igloo. The Alta Igloo Hotel is the world’s northernmost ice hotel, which is around 15 km from the center of Alta. It is as it sounds – the whole place is created from ice. That’s not just the exterior and interior building, but the beds, and even the glasses in the bar, which saves on washing up...There are 80 bedrooms including suites, as well as an ice gallery, ice-bar, ice chapel and several lounges. Not in any way simple, the hotel is decorated with ice-sculptures and works of art. Definitely an experience not to be missed. 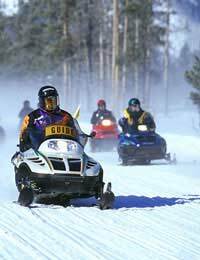 There are several tours that offer snowmobiling as part of the package, as well as actual snowmobile tours that give you the opportunity to take a safari to the borders of Finland and Sweden. You’ll need a driving licence for snowmobiling tours and they aren’t for the faint hearted – snowmobiling is hard work. Tromsø, is the capital city of northern Norway, and features many delights such as the Polar museum and Polaria, which is a fascinating Arctic aquarium that comes complete with its own panoramic cinema. If you’re feeling really brave, try a reindeer driving trip, as Norway is one of the very few countries where you’ll get the chance to have a go at it! Most trips involve a journey on a reindeer-pulled sleds, with a tour guide who will be one of the Sami people, well versed in this type of transport! Sweden is a large and very diverse country, full of culture as well as Scandinavian charm. The country is full of museums and history...as well as opportunities for fabulous winter retreats. For a true winter treat, you could visit the city of Luleå which boasts a privileged location on a peninsula where the Lule Bay meets the Gulf of Bothnia. The peninsula overlooks an archipelago of over 17,000 mostly uninhabited islands. During the winter months the sea freezes over and you can tour the islands by snowmobile or husky sled. Abisko is officially one of the best places in the world to visit if you want to experience the full on beauty of the Northern Lights, as it’s located right in the centre of the Auroral Zone and the skies are usually clear. In addition to this, there are also spectacular mountains and lakes to take in.